Holiday Cookies: Candy Cane Cookies!! We love to bake in our house. But with young children it can sometimes be difficult to include them in the baking process. That is why I try to find recipes that will allow my younger kids to help to bake and decorate, especially during holiday time. They just love helping to make the special cookies everyone eats for Christmas dessert, and the cookies they leave out for Santa. This year we wanted to try something new, but still stick with simple easy things that the kids can help with. When I was checking out recipes on the internet I ended up on Spoonful the Disney website of crafts, activities, and recipes for families. I love this site, not just because we are huge Disney fans in our house, but because all of their posts are geared towards families. This means everything has been pre-screened for appropriate content and it is designed for children to participate. In our house, that is perfection! Since we were looking for something fun and easy for our Christmas cookie recipe we were delighted to find this fun and easy Candy Cane Cookie Recipe. It is simple to make, and even simpler to decorate. Kids can help and it is even easy for the not so great decorator to make. In a medium-size bowl, mix the flour and salt. In a large bowl, cream the butter and sugar, stir in the egg, then the corn syrup and vanilla extract. One third at a time, add the flour mixture until thoroughly mixed. Next divide the dough into portions and use a toothpick to add food coloring paste (available at party supply stores) to each one. Knead until the color is evenly distributed. For a flavor surprise, omit the vanilla extract and add 1 teaspoon of lemon extract to the yellow dough, mint extract to the green dough, and strawberry extract to the red dough. Pat the dough into disks, wrap in plastic, and refrigerate for 1 to 2 hours, or until firm enough to roll. If it is too firm, soften at room temperature for 5 minutes. 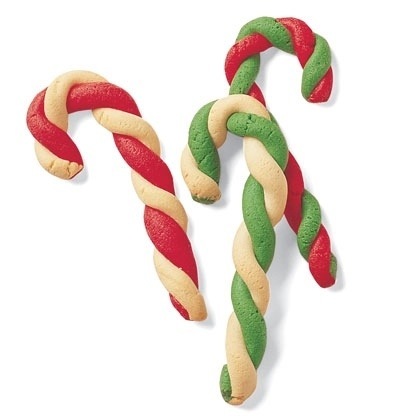 Finally, for each candy cane, form small pieces of two colors of dough into two ropes, about 1/4 inch in diameter and 16 inches long. Carefully twist the ropes together to form a candy cane. Bake for 10 to 15 minutes, or until lightly browned. 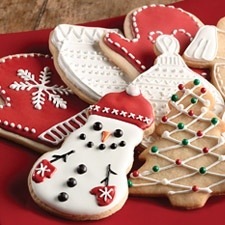 These fun cookies will definitely be a hit at our house this season! This entry was posted in Activities and tagged Baking, christmas cookies, Cookies, holiday cookies, spoonful, the boys store on December 22, 2013 by Lacy.